Implicit attitude formation, updating, and utilization: Implicit social attitudes are stored preferences and associations that we have for different social targets (e.g. social groups or individuals) that are difficult to control and of which we are often unaware. Implicit attitudes are not stable constructs, rather they continuously evolve with experience and are deployed in a context-dependent manner. 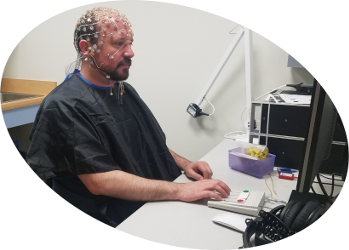 One focus of the lab is to develop behavioral and imaging protocols for assessing and modeling the dynamic nature of implicit attitudes. Research questions include: What specific neural computations underlie implicit attitude formation and updating? Is there anything unique about social, compared to nonsocial, implicit attitudes? 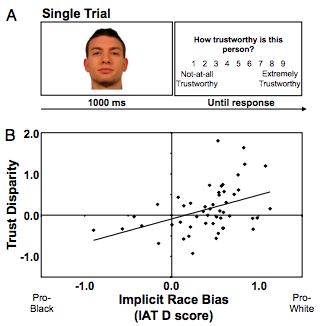 A second component of this research uses model-based approaches to characterize how, and in what contexts, implicit attitude information is integrated into social decisions. For instance, how does feedback about an individual result in updating of implicit social attitudes about their social group? 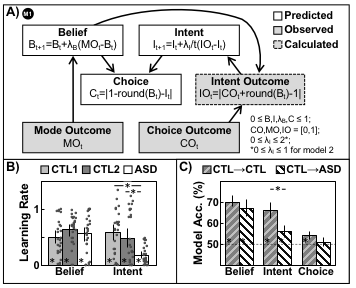 At what point in the decision process do implicit attitudes exert their influence over decisions and to what extent is this influence sensitive to intervention (e.g. contextual, instructional, etc.). 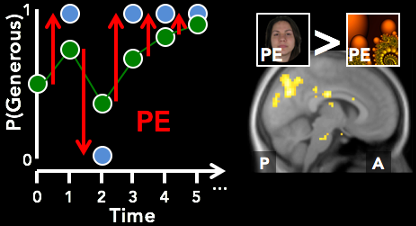 Learning about and representing other people: This line of research is focused on developing a systems-level model of the computations performed by, and the functional interactions between, individual nodes of social processing networks during learning about other individuals, predicting their behavior, and making social decisions. Questions include: What specific computations are performed by brain regions subserving ‘mentalizing’ (e.g. temporal parietal junction, anterior temporal lobe, precuneus, medial prefrontal cortex, etc.)? How does functional connectivity between brain regions vary as a function of psychological process (e.g. prediction versus updating)? How does context influence functional connectivity, feedback sensitivity, or prediction? What might be intrinsically unique to social computation and to what extent are social learning systems dedicated to social, versus domain-general, learning processes? Characterizing the computational nature of variation in social learning and decision-making: Within the computational framework that guides the lab's research, characteristic variation in social function (e.g. across individuals, specific mental states, situations, disorders, etc.) can be represented as distinct model configurations, or computational signatures. For instance, different disorders (e.g. ASD, Borderline Personality Disorder (BPD), Schizophrenia) in which social learning and decision-making is perturbed may have distinct computational signatures (i.e. specific ways in which the model is altered). This third line of research aims to leverage the findings from other lines of research (above) to characterize these computational signatures. Specifically, the lab will continue research on autism spectrum disorder and expand into other specialized populations (e.g. individuals with BPD, PTSD, etc.) to both characterize impairment and demonstrate causal relationships between the neural mechanism and behavioral expression. Model-based investigations of this type are the focus of the burgeoning field of Computational Psychiatry and a clear funding priority for NSF and NIMH. Moreover, the value of this approach is not limited to clinical applications, rather it is broadly applicable to a range of psychological phenomena (e.g. social learning and decision-making in a cooperative relationship may have a distinct computational signature from that following social rejection). Through collaboration with researchers from various fields (e.g. clinical, personality, and health psychology, cognitive neuroscience, etc.) we aim to both validate this approach and characterize neurotypical variation in social learning and decision-making across many psychological domains. We've just started doing some EEG!